It would be too easy to assume this man is some sort of unlucky victim of his parents' sadistic christening, back in the '70s, but Ryan Adams was blessed with the name David, before opting to go with a name all-too-often mistaken by fans and punters of lighter-waving stadium-rock. I'd like a pound for every record-shop customer who brought Ryan's fine "Heartbreaker" CD to the counter, instead of Bryan Adams' "Waking up the Neighbours" or "So Far So Good" - "Oh, the name looks similar, innit?". 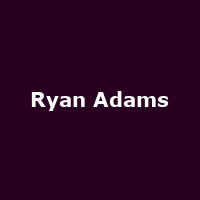 I should have sold them their mistakes instead - Ryan Adams might have had a Top 5 album by now. He hasn't (yet), but the North Carolina-born singer has gathered quite a following on both sides of the Atlantic, so no harm done. He started out in the alt-country outfit Whiskeytown in the mid '90s, knocking out three albums, not releasing almost as many and setting the scene for a more fruitful solo career which has been occasionally interspersed with alt-rock band, The Cardinals. They just happened to be Willie Nelson's backing band for a bit - as you do - but have now become a free-standing band again following Adams' recent decision to go it alone again. His two new UK shows will take place in Islington, at the splendid Union Chapel, on 27th October, followed by the Grand Opera House in York (28th) and Edinburgh's Festival Theatre just before Halloween. Tickets go on sale this Friday, priced at £32.50 for London, £26 for London and £27.50 for Edinburgh. October will also see the release of his first post-Cardinals album and a pair of intriguing UK shows. The album, entitled "Ashes & Fire", was produced with old cohort Glyn Johns and features recent single, "Lucky Now" and Norah Jones on occasional vocals. After all that Adams has battled through (demons, drugs and deaths), the new material promises much in the lyrical department! Due to popular demand, Ryan Adams has just announced another key London show to his nearly-sold out autumn tour. In addition to shows in Islington, York and Edinburgh (that last one has limited seating available), Adams will head back to the capital for a show at Cadogan Hall on 1st November. Demand will understandably be huge for this one on Friday 30th September, with tickets on sale from 9am priced at £32.50.